Open Steel Flooring and Stair Treads come in a range of sizes depending on the application. Pre-fabricated stair treads reduce installation time and can be made to size to suit you requirement. 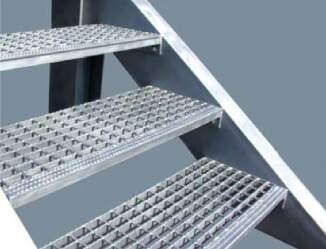 Open Steel Flooring stair treads are strong and durable with slip resistant nosing and are good structural components for fire escapes and platforms and walkways. Open mesh flooring treads are suitable for a wide range of construction and structural purposes such as vehicle and industry flooring.